On November 19, Dr. Donald Teater, Medical Adviser to the National Safety Council, provided insight into the magnitude of the drug overdose problem in the U.S. In the past 10 years, there have been 125,000 overdose deaths, especially from opioids. Every day, about 45 productive people die as a result of more morphine being prescribed. Since 2010, there have been more overdose deaths than from car crashes, and more deaths than caused by breast or prostate cancer. As more drug prescriptions are being written, the number of patients seeking treatment for overdose is overwhelming doctors handling such cases. The primary culprit is the extract from the seed-pod of the poppy plant that yields morphine and codeine and their derivatives. Used primarily for alleviating pain, opioids are also prescribed for anxiety and depression. Although they relieve anxiety and depression, they should not be prescribed because they can become addictive. Opioid addiction is a disease model, like diabetes or COPD. It has a genetic disposition, and it causes biological changes in the brain that damages brain chemistry. Its effects can be mediated by medication to get over an addiction. However, like other chronic diseases, it can be controlled but not cured. Unfortunately, disease flare-ups are often treated by jail, not by medical intervention. Addiction carries the stigma of moral weakness rather than being viewed as a real disease. Narcotic addiction often results in traffic accidents, falls, and mental confusion. Furthermore, addiction often delays recovery from some medical conditions such as back pain. Opioids can even increase sensitivity to pain in these cases. For relief, other pain medications such as acetaminophen are often better. Dr. Tester applauded several Dane County programs, including the Medical Drug Program that disposes unused pills. Others are the Safe Community Parent Addiction Network and the Health Care Task force for Safe Opioid Prescribing. The battle to control opioid misuse must be ramped up considering that the societal cost of this disease totals over $55.7 billion dollars a year. This entry was posted in 2. 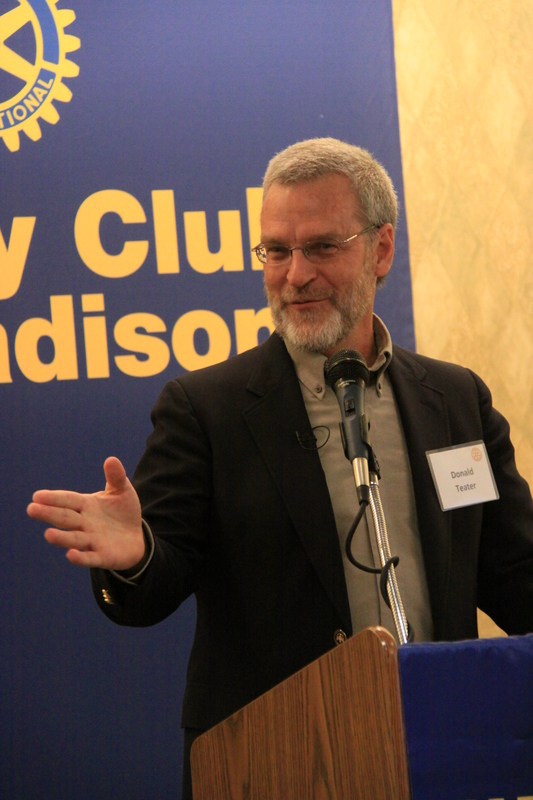 Meetings, Rotary Club of Madison, Rotary Weekly Guest Speaker and tagged anxiety and depression, Donald Teater, Narcotic addiction, National Safety Council, Opioid addiction, Rotary, Rotary Club of Madison. Bookmark the permalink.